Education Jump-Off: Where is Thumbkin? 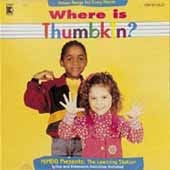 Looking through the Kimbo catalog today I came across the “Where is Thumbkin?” CD. It brought back memories of when I utilized this for my now 18 year old. She had been enrolled in a mom and me class at the local park where they incorporated a lot of music. One day while I was doing some surfing I found a curriculum for it and purchased it. There are a lot of hands on activities to be used with each of the songs on the CD. There are songs for each month of the year making it a great supplement for a fun day. Songs included out side of the title song are “Grey Squirrel,” “Five Fat Turkeys,” “Raindrop Song, “ “Do Your Ears Hang Low?” and more. The curriculum however includes more songs than those on the CD. You could easily find some at the library if they carry music or even download them from the internet. I have put songs up on the internet temporarily in the past, now you could probably find some on You Tube. This is a fun way for three to six year olds to build important skills. Funny my children are all too old for this, yet I still have the cassette. The lyrics for each song are included and they are broken down according to the month they should be used. At the end of each song is an activity suggestion for the month. Kimbo is selling the CD for $15.99 along with an activity guide, however I would be willing to sell anyone interested the cassette I have for $5.00 plus shipping. While looking to share this post with another homeshool mom not only did I realize I did not add links, but that there is now another CD called "Here is Thumbkin."